Mark Wilson/Getty ImagesTim Kaine in his office at the US Capitol. As Hillary Clinton whittles down her search for a vice presidential running mate, Sunday’s political talk shows presented two different, yet equally intriguing paths for her potential general election ticket. On “Meet The Press,” Virginia Sen. Tim Kaine defended his simultaneous personal reservations about abortion and belief that it should be legal. “I’m a traditional Catholic. Personally, I’m opposed to abortion and personally, I’m opposed to the death penalty,” Kaine said. Several recent reports revealed that the Virginia senator is likely one of the three candidates on the short list — Sen. Elizabeth Warren and Department of Housing and Urban Development Secretary Julian Castro are also reportedly on the list. Kaine’s wide breadth of experience as senator, governor of Virginia, mayor of Charleston, and chair of the Democratic National Committee has endeared him to many Democrats who believe Clinton should select a tested running mate with a successful career in politics in a key battleground state. 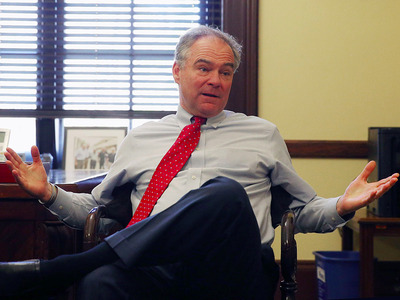 Kaine spent much of Sunday’s interview walking host Chuck Todd through his stance on issues like abortion and gun control, explaining his concern with an assault weapons ban and favourable view of a high-capacity magazine ban. Despite his depth of experience, some party figures worried about an enthusiasm gap among Democratic voters turned off by Clinton fear that Kaine would do little to excite the party’s left wing after a contentious Democratic primary. The senator has been viewed as more sympathetic to anti-abortion advocates for his own religious reservations about abortion, and supports the Trans-Pacific Partnership, a multi-national trade deal criticised by many liberals for unfairly benefiting large international corporations at the expense of workers. When Todd read the senator several recent news excerpts detailing his less-than-exciting personality, Kaine laughed but didn’t deny he was boring. “They’re true. I am boring. But boring is the fastest growing demographic in this country,” Kaine said, chuckling. But if Kaine offers an experienced establishment figure, Department of Labour Secretary Thomas Perez represents a different approach. Appearing on “This Week” on Sunday, Perez showed why he has generated his own buzz among insiders, and is on a list of candidates being considered. Perez’s interview on Sunday was the perfect example of what Clinton’s pick will look like as a liberal attack dog. While Kaine took just one swing at Trump during his interview, Perez relentlessly slammed the real-estate mogul on Sunday, criticising his responses to the terrorist attack in Orlando and the United Kingdom’s decision to leave the European Union. “Is Donald Trump qualified to be president? The answer is no. He’s a chaos candidate. The differences between Secretary Clinton and Donald Trump in terms of temperament, in terms of judgment, in terms of values couldn’t be more stark,” Perez said. One of the top-ranking Latino officials in the Obama administration, Perez’s close ties with progressive groups and unions during his time in the Departments of Labour and Justice could help gin up enthusiasm among liberal and minority voters. Warren, a highly speculated VP pick herself, reportedly told Perez that he’d be a good choice for the job. Some observers note that while Perez could help shore up progressive support, the labour secretary comes with his own risks. He has never been elected to state or national office, and hasn’t had as much experience as other picks like Kaine, Warren, Castro, or Ohio Sen. Sherrod Brown in front of the national press.Before and after the Democratic presidential debate in New York in April, the labour secretary wandered through the press area relatively unnoticed. He spend much of Sunday’s interview appearing to stick to talking points, repeating that Trump was working for himself and not voters. But some see Perez’s aversion to theatrics as an asset. In his past role as the White House Hispanic Media director, current Democratic National Committee communications director Luis Miranda Perez worked closely with Perez, who himself was then assistant attorney general for civil rights at the Department of Justice. When asked about Perez’s low-profile at the Democratic debate, Miranda said that Perez was defined by his desire to accomplish goals rather than boost his own profile. “That’s just his style. He’s not a showboat. He’s a guy who gets his head down and gets the job done,” Miranda told Business Insider in April. While their styles differed dramatically, Kaine and Perez shared at least one thing in common: They won’t speculate on their own chances as being selected. “People will speculate, but I’ve got one job and one job only right now, and that’s to work hard for Hillary Clinton,” Kaine said when asked about his thoughts on serving as Clinton’s running mate. During “This Week” on Sunday, Stephanopoulos read several recent newspaper headlines suggesting that Perez could be a positive addition to the ticket. Perez smiled and shook his head slightly, and when Stephanopoulos asked him if he was up for the job, Perez also dodged. “I’m interested in making sure we continue — I’ve got 207 days until the weekend — how I can continue to build an economy who works for everyone. And I want to make sure that Hillary Clinton is the next president of the United States,” Perez said.